Hi everyone! I'm here today to share a project I did for Echo Park showing how you can incorporate journaling cards into your projects. My layout features the new Lucky in Love collection, but you can easily apply these techniques to any collection. You'll find journaling cards on three of the papers in this collection, so there are plenty to choose from! On my page, I left a couple of them as is, I cut elements from some of them (banner and heart doily), I used a circle punch to create an embellishment (aqua heart) and lastly, I cut the inner portion of one out, leaving the border around it intact on the background paper so I can use it as a frame on another project. To give you an idea of how I used the journaling cards, I've put together a step-by-step tutorial so you can see how it came together. This collection contains two each of six double-sided papers. We'll be using both sheets of some of the papers. 1. 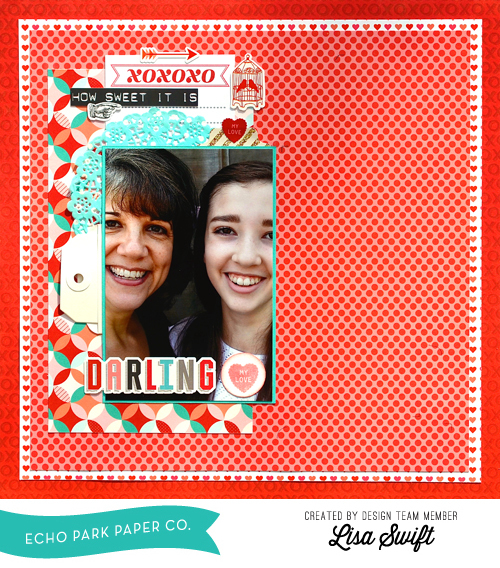 Use one sheet of the "Love This" paper as the background for this layout. 2. Cut 1/2" off of the right side and 1/2" off of the bottom of one sheet of the "Lovely Circles" paper. Adhere this paper, with the heart pattern facing up, to the "Love This" paper, leaving a 1/2" border on all sides. 3. Cut 1 1/2" off of the right side and 1 1/2" off of the bottom of the "Sweet Hearts" paper. Adhere this paper, with the polka dot pattern facing up, to the "Lovely Circles" paper, leaving a 1/4" border on all sides. 4. Machine stitch a straight border around all sides of the polka dot paper, 1/8" in from the edge. Now let's do a bit of prep work and get some journaling cards ready before putting the rest of the page together. 5. Cut the gold striped journaling card from the "B" side of the second sheet of the "Love This" paper. 6. Cut the "Love" bingo card and "Hello sweetheart" banner from the "Journaling Cards" paper. Use a circle punch to punch the aqua heart out of the oval journaling card. 7. Cut the chevron circle, "XOXOXO" journaling card (trimming along the white edge of the card) and the large red heart "doily" from the "Be Mine" paper. With the journaling cards prepped and ready, we can start assembling the rest of the layout. 8. Cut a 5" wide x 8 3/4" high piece from the second sheet of the "Lovely Circles" paper. Adhere this piece 1 1/8" in from the left edge of the "Love This" paper and 1 5/8" up from the bottom edge. 9. Adhere the "XOXOXO" journaling card over the "Lovely Circles" paper, placing it 2 1/2" from the left edge of the "Love This" paper and 1 3/8" from the top edge. 10. 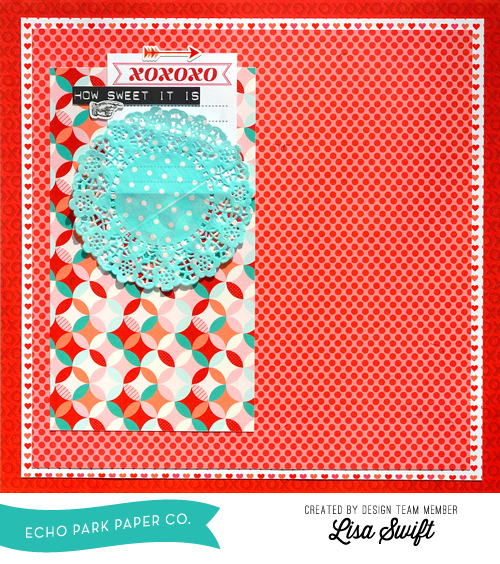 Layer an aqua polka dot doily over the "XOXOXO" journaling card and "Lovely Circles" paper. 11. Mat a 4" wide x 6" high photo on turquoise cardstock. Adhere the photo over the doily, placing it 2 1/2" in from the left edge of the "Love This" paper and 2 3/8" up from the bottom edge. Before adhering the left side of the photo, tuck a bitty bag under the photo (this will later hold a journaling tag). Finish adhering the photo to the page. 12. Embellish the top and bottom areas of the photo as shown. 13. Adhere the "Notes" tag from the Element Stickers sheet to the polka dot paper, placing it 1 3/8" from the top edge of the "Love This" paper and 2 5/8" from the right edge. 14. Adhere the gold striped journaling card over the "Notes" tag. 15. 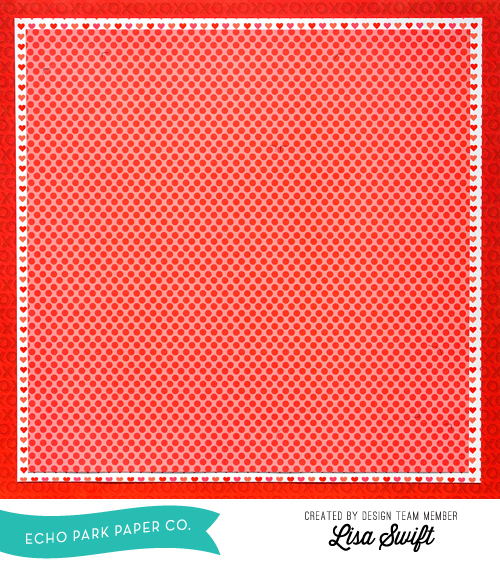 Layer the red heart doily over the "Notes" tag and gold striped journaling card. 16. Place the chevron circle over the red heart doily. 17. Adhere the "Love" bingo card flush against the right side of the photo, 3" from the bottom edge of the "Love This" paper, aligned with the second dotted line on the chevron circle. Before adhering the bottom right corner of the bingo card, tuck the bingo card sticker from the Element Stickers sheet under the left edge. Stitch a red button over the "O" in "Love" using white embroidery floss. 18. 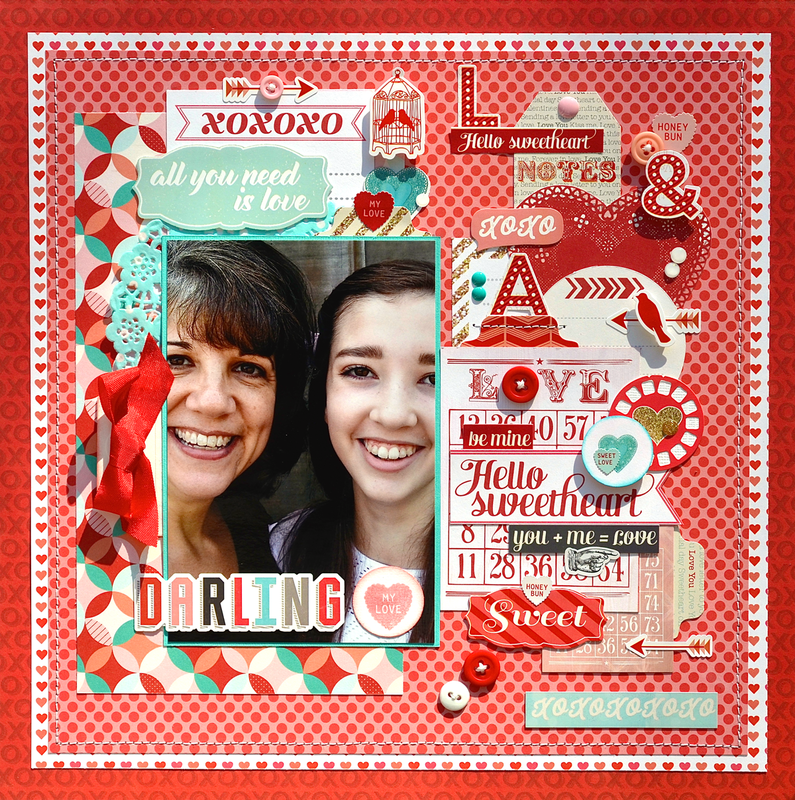 Layer the "Hello sweetheart" banner over the bingo journaling card. 19. Add remaining embellishments (stickers, buttons, and enamel dots) as shown. 20. Print your journaling on a white shipping tag. 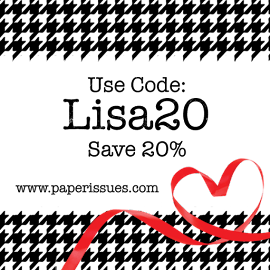 Ink and embellish with red ribbon. Slide the tag into the bitty bag behind the photo. I hope you enjoyed getting a look at my process today and seeing how this page came together. :) For future reference, you can find a link to this post under the "Process Posts" tab on my blog's home page. What a beautiful photo of you and your daughter - she's a mini-you (both gorgeous). Thanks for the tutorial - I love layers and they sometimes baffle me - great breakdown - love it! Aww, Lisa, what a gorgeous photo of you and Alexa! Love the teal mixed in with all that red and thank you for sharing your awesome process! Fabulous layout, Lisa! 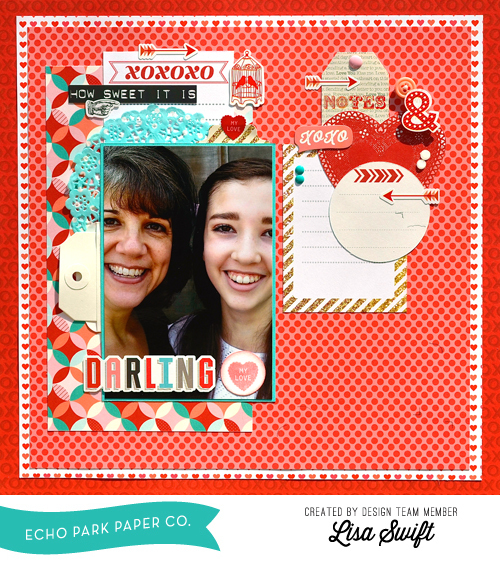 I love how you framed that beautiful picture of you and your daughter with the journaling cards! Wonderful photo of the two of you! Love seeing some of the process and how you balanced the photos with embellishments! And great tutorial of your process. Thank you so much for showing your process!! Love seeing inside that creative mind of yours!! I tried to make a card today and thought of you and the way you always seem to know just what to put on your cards and where!!! This is a wonderful page with that super great pic of you and Alexa - my favorite thing besides the awesome colors and groupings is the added beauty brought with the buttons stitched on!!! Great job!! Hope you are having a MARVELOUS (like you) day!!!! You are amazing! I am always in awe of how much you incorporate on a page!! This is gorgeous! LOVING that photo and the colors!!!!! The mix of Red and Teal is so awesome Lisa! And love seeing your process for putting the layout together!! Awww such a sweet layout and a sweet photo of your daughter and you. Love to see you and your daughter in the same picture ! Beautiful layout and great mix of red and aqua ! Great photo of the two of you, Sweet layout too! Thanks for sharing your layout process! Love the photo, so sweet. And this is a beautiful page! What an absolutely gorgeous page and picture!!! Thanks for sharing the process ~ will be pinning!!! So glad I did not completely miss this one. So nice to see you in a picture with your daughter!! You both are gorgeous!!! !